One of the most visible qualities of Horace Mann School is the exuberant energy of its students. This special energy can be found in our classrooms, where active learning and a vibrant exchange of ideas takes place. It overflows the classroom and animates the students in the cafeteria, the hallways, and the playing fields. Generated within the school, this energy makes a difference in their lives. The School encourages and directs this energy by providing a program rich with opportunities and challenges and a faculty that creates a stimulating classroom environment. Success as a Horace Mann student involves making personal choices about one’s interests, strengths and weaknesses, and personal integrity. Our students develop a strong background in traditional liberal arts disciplines through required and elective courses, independent study opportunities, and clubs. They make choices every day about which activities to pursue, how to demonstrate their skill in courses in which they excel and how to improve in subjects that they find more challenging. They are expected to support our core values, which in the Upper Division, include the Honor Code. Teachers, advisors, deans, and administrators are available to provide guidance in making all of these important choices. Approximately ninety teachers conduct the academic program for more than 700 Upper Division students. Over thirty have earned doctorates, and virtually all have advanced degrees. In seeking new teachers and retaining current faculty, Horace Mann emphasizes talent and achievement in the teacher’s curricular subject area, a proven ability to relate to high school students on an intellectual and human level, a track record of bringing the subject alive in the classroom while maintaining very high academic standards, and an ongoing love of learning and teaching. For most of Horace Mann’s history, the high school program has been organized around subject-based departments. These include English, foreign language, history, mathematics, science, studio and performing arts, physical education, and computer science. In order to graduate from Horace Mann, each student must complete requirements in each of these departments. In addition to four years of English, Horace Mann’s graduation requirements include three years of history (Atlantic World, U.S. History and a history elective), two years of science (Biology and Chemistry or Physics), mathematics through Algebra II and Trigonometry, foreign language through the third-year level, one computer elective, and two credits in the arts. Students must also complete physical education, a guidance course in grade nine and a course taught by the Office for Identity, Culture and Institutional Equity in grade eleven. In addition to these requirements, Horace Mann students are attracted by an enormous variety of elective and independent study alternatives provided by each department. At Horace Mann, education takes place not only in the traditional classroom setting but throughout the campus. Extracurricular activities are a vital part of the school program for all students, and most Upper Division students would agree that they learn as much outside of the classroom as they do inside. The scope of offerings is designed to encourage each student to find areas of interest. In each activity, students bear substantial responsibility for leadership, and many learn important leadership skills in their clubs and activities. 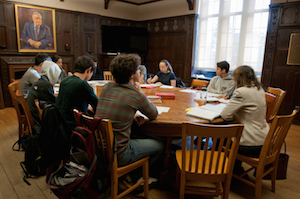 The Upper Division Tutoring Office supports Upper Division students in all areas of academic endeavor by offering additional instruction in the sciences and the humanities during normal school hours. The Tutoring Office is located on the first floor of Tillinghast in room 132T. Tutoring begins after a goal-setting consultation between students and their subject teachers, which may be initiated by students, teachers, the Deans’ Office, or the Guidance Office. Access to the Tutoring Office's calendar and a description of procedures governing the Tutoring Office are provided via the Student Life page on the Haiku. Students play an active role in the life of Horace Mann. The Community Council brings together students and faculty members to discuss issues that affect the school community. Class government and the Disciplinary Council offer more students the opportunity to be involved. The strong emphasis on writing at Horace Mann yields more than fifteen student publications, including The Record, our weekly newspaper. More than sixty-plus clubs are available to students. Athletic teams provide both a substitute for the required physical education courses and an extracurricular option. More than forty junior varsity and varsity teams in twenty-five different sports take advantage of our extensive indoor and outdoor facilities. Participation on teams supply our students not only an athletic workout but also valuable lessons in teambuilding, persistence, leadership, and sportsmanship. In the Upper Division Theatre program, extracurricular activities and academic courses exist side by side. The Upper Division offers three major productions each year; the students in the Theatre Crew design sets and lighting and produce these shows. All Horace Mann School students engage in Service-Learning projects within Riverdale, the Bronx, and the wider tri-state area. They work with diverse communities on meaningful projects and reflect on their experiences, with their classmates, as part of the Division's Service-Learning requirement. The program at the Upper Division encourages students to take meaningful responsibility for their education, behavior, and conduct. While the school expects independence, it also nurtures and supports interdependence among faculty members, administrators, peers, parents, and families. During the high school years, as students prepare for the transition to college and away from home, relationships between students and parents inevitably evolve. The Upper Division administration fosters a close working relationship with parents and regards them as our partners in the educational process. Students demonstrate growing maturity in their increasing ability to manage competing demands on their time and energy with self-discipline and integrity. We encourage students to define a path between appropriate self-interest and the greater good of community and society. It is no surprise then, to find many students creating individual paths to success through meaningful service to Horace Mann and the larger world. Each year, Horace Mann’s approximately 185 graduates enter some of the most selective colleges and universities, offering them myriad academic and personal choices. Our faculty, staff, and administration feel a special responsibility to support each student’s development of an ethical compass for guidance both at Horace Mann and in that new and exciting collegiate world that follows. Only students so equipped will be able to navigate successfully the extraordinary intellectual opportunities and challenges that lie before them. While all of the school’s academic and extracurricular programs, and the talented faculty at Horace Mann School, create a lively learning environment, it is the students at Horace Mann who make the School unique. Those students, in recent years, have won National Merit Scholar and National Achievement Scholarships, been selected as Presidential Scholars, broken city-wide athletic scoring records, won New York City community service awards, and produced nationally recognized publications. Horace Mann students have created beautiful works of public art on campus, acted as international ambassadors as they travel abroad, and performed solos in Lincoln Center. They have, through the Horace Mann School Summer Internship Program, made an initial mark in the professional world outside of Horace Mann. Finally, they have gone on from Horace Mann to distinguish themselves and realize the school’s vision by pursuing “great and giving lives.” These students are the hallmark of the Horace Mann School Upper Division.